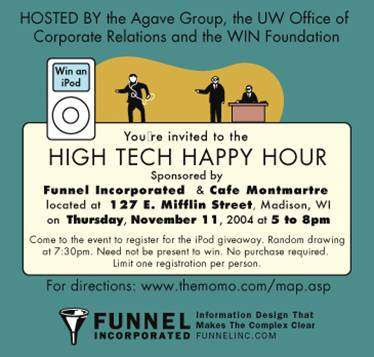 Events - Wisconsin Advanced Technology Advocates, Inc. The Manufacturing Advantage Conference provides a forum for manufacturers from across the region to learn best practices and participate in practical learning through interactive, hands-on breakout sessions, industry-expert keynote speakers and ample networking opportunities. We strive to carry on a solid tradition of providing impactful experiences to help manufacturers succeed in the areas of strategic direction, top-line growth, process improvement and people and culture. "To Infinity and Beyond: The Accelerating Universe," a live broadcast from the World Science Festival about dark energy, an antigravitational force that confounds the conventional laws of physics, will be hosted on the evening of May 28 by UW-Madison'sSpace Place. Originating from New York and moderated by internationally known theoretical physicist and bestselling author Lawrence Krauss, the broadcast will take place from 7 to 8:30 p.m. Thursday. Space Place, the UW-Madison astronomy outreach outpost, is located in the Villager Mall, 2300 S. Park St. The event will be held in the mall atrium. OVERVIEW: Join us for a lively two days of information-sharing and discussion regarding this important - and often challenging (sometimes controversial) - topic! This year's program is designed to allow participants to explore these questions: How do we define “sustainability” and what are the causes of “unsustainability?” What are the most relevant technologies for us to understand? How are various sectors and organizations responding to these issues, e.g. governmental units, research/educational institutions, businesses and faith communities? What is the role of the individual decision-maker? Does what one person does - or does not do - matter? The First Annual Wisconsin Stem Cell Symposium will be held April 19, 2006 at the BioPharmaceutical Technology Center (BTC), 5445 East Cheryl Parkway, Madison, WI. MADISON-Cultural considerations are increasingly vital in multidisciplinary research as more scientists stray from narrowly focused studies to expansive, boundary-blurring questions, a University of Wisconsin-Madison psychologist will announce to attendees (May 27) at the 17th Annual Convention of the American Psychology Society in Los Angeles. Academic fields are rapidly converging to form emerging hybrids with tongue-twisting names such as psychoneuroimmunology. But, Ryff says, integrative work cannot tell the whole story - or hope to create tailored, individualized interventions - unless researchers pay heed to the broader cultural context of their work. The grant was enumerated in 2001 Wisconsin Act 16. Leaders of 33 young technology companies are practicing their pitches as they prepare for the Wisconsin Life Sciences & Venture Conference in Madison on Tuesday and Wednesday. Traditionally, it's a chance to show potential investors some of the area's brightest discoveries with the best prospects for success in the marketplace. Companies with products aimed at curing cancer, preventing strokes and identifying malignant breast tumors are among those that will try to persuade venture capitalists and other early-stage backers, sometimes called angel investors, to put money into their technology. And this year, organizers have tied in a second-day program showcasing some of the promising research at UW- Madison that's not yet ready for the marketplace. Wisconsin Life Sciences & Venture Conference November 16 and 17. MADISON, Wis. – Members of the Midwest’s leading association of foreign trade commissioners will attend the Wisconsin Life Sciences & Venture Conference, Nov. 16-17, in Madison. The ethics of face transplants is among the issues to be discussed at the World Congress of Bioethics, which will be hosted by the University of New South Wales (UNSW) next week. Face Transplantation: Surveying the Preliminary Ethical Issues, follows the announcement by a British surgical team of their intention to attempt this controversial procedure. While recognising that the technique carries too many risks to be sanctioned, the authors predict it cannot be long before it transcends from science fiction to reality.